If you haven’t tried Sit Spot yet, you should try one because it’s found to improve mental, physical, and spiritual health. A Sit Spot helps you to anchor your life. It helps you settle down and be present in the moment as you observe everything that is happening around you. Spending time with nature connects you with the earth while enjoying the grounding effects that are great for your mind, soul, and body. Nature and Forest therapists suggest that finding a Sit Spot that you can visit regularly is a great way of connecting with the earth. If you have a backyard, you can choose a spot where there is less distraction and where you can find a state of peace and calm. But if you live in a city, you can go to your local park and select a spot where you can feel comfortable. Choose a bench, a stone, or a ground that you can sit on. Then visit this place regularly. 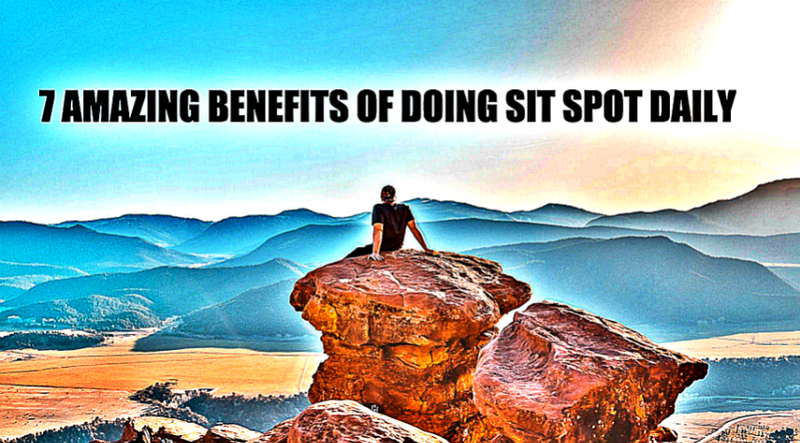 When you have established the routine of visiting your Sit Spot regularly, you will reap these amazing benefits. Being alone in your Sit Spot allows you to engage in a self guided mindfulness practice. Nature is a very powerful means that restores your directed attention and guides your brain to focus only on one thing at a time. Sitting there while observing the world around you helps you to just “be”. In a world where technology keeps you connected, a disconnect is a pleasure you can’t enjoy. It takes a lot of effort and letting go to disconnect with the real world and be with yourself and with nature. Your Sit Spot gives you the disconnect you need, provided, of course, that you leave your phone at home and allow yourself to be totally free of any distraction in your Sit Spot. A 30 minute time in your Sit Spot without your phone won’t harm you. Later on, you’ll thank yourself for doing this. On your first visit to your Sit Spot, you may not yet be fully aware of the nature around you because you’re still settling yourself and having the feel of everything. But once you visit there regularly, you begin to notice the small details of nature. You may find the varying species of birds, the different shades in the color of leaves or even the different smells of flowers. Scientific studies show that our positive response to nature is a result of our evolutionary development where the outdoors used to be our home. These positive effects include lower stress levels, lower blood pressure, lower pulse rate, and lower sympathetic nerve activity. Consuming Mycobacterium, a bacteria found in soil, has also been found to decrease the levels of anxiety, according to research. A study found that people who walked in nature are less anxious, less focused on the negative aspects of themselves, and possessed a more positive outlook on life compared to people who walked the same length of time in an urban setting. Time spent outside has a profound impact on a person’s mood. Spending time in your Sit Spot provides just that. Spending too much time on draining tasks makes your brain foggy. A Sit Spot relieves your mind of mental fatigue and helps you get back your focus, thereby increasing your creativity. Even shorter periods spent outside are found to have a positive impact on your creativity. So when you’re faced with a difficult task, take the boost you need by spending some time in your Sit Spot so that you can aproach your tasks with a fresh mind and enhanced creativity. Nature has the ability of shaping your character into becoming more generous, trustworthy, and having the willingness to help others. These character traits are seldom observed by people who rarely get out into nature. Aside from the benefits listed above, having a Sit Spot time allows you to have your place in the great circle of life and how magically you are connected to all the beauty that surrounds you. Be a happier you and start looking for your Sit Spot now.